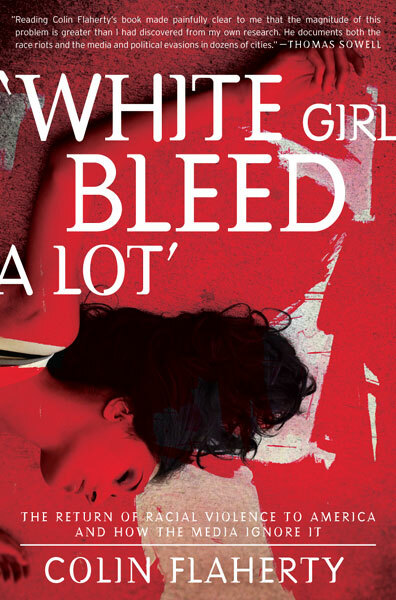 White Girl Bleed A Lot—The Return of Racial Violence to America and How the Media Ignore It: Across America blacks are marauding and beating up on innocent whites. Black mobs raid Walmart, and other stores, stomping on white customers and robbing the shelves. In Illinois, Wisconsin, Greenville, Orlando and elsewhere, black thugs gather into gangs and terrorize whites. Colin Flaherty, award-winning news reporter, has authored this incredible, fact-filled and politically incorrect report. He shows how race riots and heinous, black-on-white murders are regularly covered up by the liberal media. The Obama Administration is definitely fostering much of this violence. Race wars are here, now, and will grow worse. Here’s absolute proof.